It’s a relatively niche space, but Essential is innovating a bit. The Essential Phone’s first proper accessory attachment, its 360-degree camera, is finally slowly shipping to early buyers and is available to add to new Essential Phone orders. At $199, the 360-degree camera isn’t exactly an impulse purchase and is in the same price range as other 360-degree offerings, like the Samsung Gear 360. But just look at it: it’s so small, and it’s an interesting example of the types of things that are possible with the Essential Phone’s pogo pins and fast wireless data transfer system. Even though the Essential 360-degree camera doesn’t have any interoperability with other devices, it sure is a cool piece of technology and worth seeing how it works — and importantly, how that measures up to Essential’s claims and expectations. As you’d expect, the Essential Phone’s 360-degree camera is dead simple … almost to a fault. Just snap the camera onto the back, where it attaches with a satisfying clunk of strong magnets, and the camera app will load up in a few seconds directly to the 360 capture mode. You can switch the camera between 4K and 2K resolution, tap a button to re-center the image, and then take a photo or capture video. Yup, that’s it. 360-degree photos and videos are saved automatically into the photo gallery, right alongside all of your other photos and videos, where you can share them out — so no dealing with other storage media or transferring files. You can share the 360-degree photos and videos to all of the usual places like Facebook, YouTube, Google Photos, Flickr, etc. and they have all of the proper metadata to show up just perfectly. 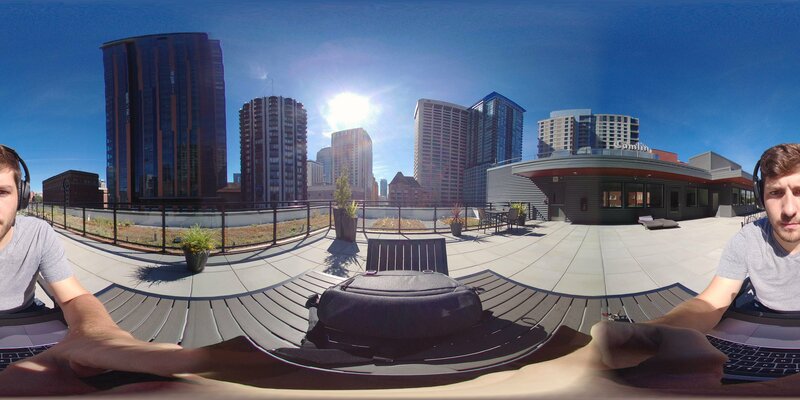 Here are a few good photo samples that give you a feel for what the Essential 360-degree camera can do. One in harsh, one-sided lighting outside, one in consistent lighting outside, and one inside during the day. The photos look pretty good and have plenty of resolution to be competitive — even though it may not seem too impressive when you compare it with 13MP stills from the main camera. Colors are accurate and no part of the scene is really blown out or blurry, which is about what the average person is going to expect. The stitch between the two lenses is noticeable still, but is pretty well smoothed — it’s only really pronounced in the first photo, which has very strong lighting only hitting one of the lenses. 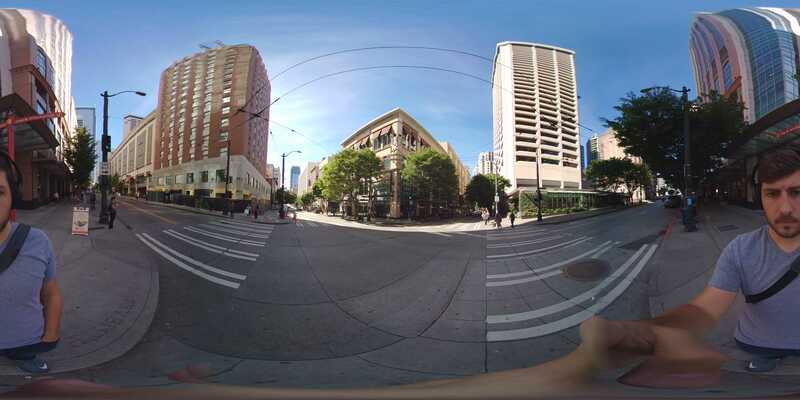 Each 360-degree photo is just 1-2MB. Though it isn’t necessarily surprising, it’s disappointing to see that the Essential Phone’s camera app doesn’t seem really ready for the 360-degree camera. There’s no option to shoot with just one lens or the other for great one-shot panoramas, nor can you actively switch between standard and 360 shots on the fly. The camera app itself is still quite slow, as you’d expect if you’ve read any of our previous Essential Phone coverage. In the above video clip, you’ll get a good taste for a few different aspects of the Essential 360-degree camera. First, you get a feeling for how sensitive the microphones are — or at least, how they’re primarily tuned to hear what’s very near to the camera. You can in some cases hear me breathing at an arm’s length away, and at the same time barely hear cars driving by at 20 mph. A few small issues aside, this is really solid 4K 360-degree video out of a tiny camera. Next, you see how much walking and movement affects the video quality. It’s not too bad, actually, and there isn’t too much of a jelly effect with the processing applied to it. Then you get to see what things look like when the camera is still (toward the end of the video) — things look really good here once you take the shaking and movement out of the equation. And remember, this is just handheld. Across the whole video, you notice a couple of small downsides. There’s some odd artifacting in a few places, and there seem to be unnecessary stitching lines where you wouldn’t expect — like directly down the middle of one of the lenses, which is odd. Both of those things, and the sensitive microphones, can indeed be fixed in software. Those small quibbles aside, the core experience here when it comes to video is quite good. That’s solid 4K resolution video out of what is a really small camera setup. Essential got a whole lot right with its 360-degree camera. It’s extremely compact by 360-degree camera standards, and is relatively inexpensive at $199 — and at the same time, it shows off the great capabilities of the phone’s pogo pins and wireless data transfer. The quality of its photos and videos are quite good, too, which isn’t always easy to do on the “first” try for a product like this. As is the case with the rest of the experience, the 360-degree camera is hamstrung by software. As is the case with the rest of the camera experience on the phone, though, the 360-degree camera is somewhat hamstrung by its software. Being able to quickly take and share 360-degree photos and videos just like any other photo is really awesome, but the camera app lacks many features that would be very useful — like simply being able to switch between 360 and standard photos on the fly, or stream 360 videos to Facebook and YouTube. The Essential 360-degree camera itself isn’t going to sell anyone on the Essential Phone, but as proof of what its technology can do and yet another piece of the ecosystem, it definitely serves its goal. It’s a really solid and not-too-expensive 360-degree camera option.